Summary: On the afternoon of December 22nd, accompanied by the director of Jining High-tech Zone Bureau of Statistics Li Shoubian, director of the service department of Shandong Province Bureau of Statistics Ni Huaqiao, Xing Wen, visited Shandong China Transport Group. On the afternoon of December 22nd, accompanied by the director of Jining High-tech Zone Bureau of Statistics Li Shoubian, director of the service department of Shandong Province Bureau of Statistics Ni Huaqiao, Xing Wen, visited Shandong China Transport Group, for the investigation and research on the enterprise e-commerce and e-commerce platform operation. Chairman and general manager of Shandong China Transport Group Quqing, executive vice general manager Hanyong, vice general managers Li Zhenbo, Sun Shijun and other leaders accompanied reception. 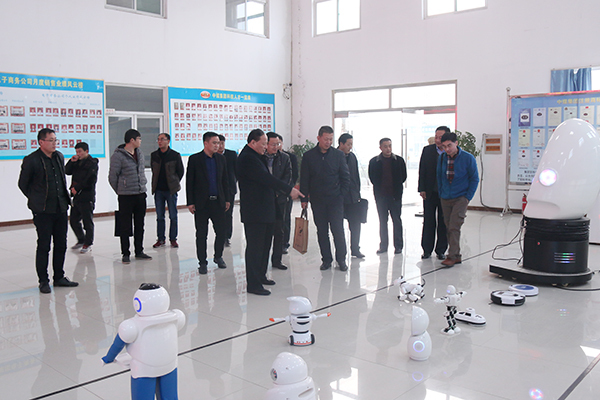 The leaders of the delegation visited group’s e-commerce companies, cross-border e-commerce companies, network information company, software technology company, Weixin agricultural science and technology company, and Kate robot intelligent company, and jointly watched the on-site demonstrations of high-tech agricultural UAV drone and intelligent robots, and gave a high degree of evaluation. At the symposium, general manager Qu made a detailed report on the development of our group’s industrial e-commerce and the operation of the six major e-commerce platforms. Focus on introducing the cross-border e-commerce platform 1kuang.com which independently developed and operated by China Transport Group. The specific situation of the network, development orientation, economic benefits, social benefits and future development planning and so on. General manager Qu said, China Transport Group adhere to the development strategies of vigorously promoting the depth integration of information and industrialization in our country, actively developed industrial supply chain e-commerce, and succeed in the transformation from traditional sales model to modern e-commerce sales model, promoted Shandong Province and even the national e-commerce development, and became the industry model of transformation enterprises through integration of information and industrialization. In 2012, the group independently developed and operated the cross-border B2B e-commerce platform in industrial and mining machinery industry - 1kuang.com, which was the world’s leading and the first one in our country. The platform filled the domestic and international mining machinery industry cross-border e-commerce public service platform blank. In 2013, 1kuang.com was selected as the national Ministry of Industry e-commerce integrated innovation pilot project, and as a key supporting project of cross-border e-commerce by the national Ministry of Industry. It made outstanding contributions to promote the country’s machinery manufacturing industry transformation and upgrading, and received the height evaluation by the national leadership many times! The leaders visited our group and gave a high degree of certainty for the outstanding achievements in the creation of business platform, and gave a full recognition of the group with its significant contribution to promoting the province’s e-commerce development in the trade. Director Ni said, Shandong China Transport Group as the leading e-commerce enterprise in Shandong Province, achievements e-commerce platform for building was obvious to all, and the contribution was also very worthy of recognition, especially the creation of cross-border e-commerce platform - 1kuang.com, led the national machinery manufacturing industry innovation and transformation, and sat a new benchmark for the rapid transformation of industrial enterprises in Shandong Province. I hoped that China Transport Group would play an exemplary lead role to better lead the province’s enterprises to explore e-commerce development of new ways in next step, and strive to make more contributions for the province’’s industrial economy and the country’s rapid development! General manager Qu said, it was very grateful that leadership of the provincial Bureau of Statistics’’ fully affirmed the achievements of the development of China Transport group. China Transport Group would live up to expectations, persistent efforts, pioneering and innovative, and actively improve the platform of the six major e-commerce platforms functions, and promote the success of the experience to the community through the Ministry of industry and information technology training schools, to help more enterprises embarking on the road of e-commerce development, and better to help the province’s economic development!